MBIR of San Antonio Texas is an Islamic community in association with the leadership of Imam W. Deen Mohammed, that proclaims in word and deeds the universal message of Al-Islam that there is but One G-d* and one human family. We are committed to establishing a balanced community in its broadest sense, witnessing the eternal wisdom of the Words of G-d and the life exemplified by Prophet Muhammed (peace and blessings be upon him). We will cultivate the patterned growth of human excellence and good character through building valuable relationships with all G-d conscious people. A community that is balanced, witnessing to all people, a community that G-d establishes, approves of and supports. The purpose and aim of MBIR of San Antonio Texas is to be a fully functioning Islamic religious institution, a model community, in order to serve the needs of its members in the fullest sense, not leaving anything of value out. Its teachings are based on the Qur’an, sound traditions and life example of Prophet Muhammed (PBUH) and the Tafsir (commentary) of Imam W. Deen Mohammed, son of the Honorable Elijah Muhammad. We will provide Islamic education to all Muslims and the general non-Muslim public. We intend to foster and establish relationships with all G-d fearing people regardless to race or religious denomination. This community proudly bears the name of one of the greatest Muslims: Bilal was an African of Ethiopian heritage, companion of Prophet Muhammad, (Blessings and Peace of G-d be upon him) born in Mecca, was chosen as the first Muezzin (Mu'adhin-caller to prayer) by the Prophet himself. He was known for his beautiful voice with which he called the people to prayer. Bilal was of key importance in the history of Islam. He is said to have been one of the most trusted and loyal Sahabahs (companions). His respected stature during the birth of Islam is often cited by Muslims as evidence of pluralism and equality in the foundation of the religion. He was constantly close to Prophet Muhammad, and a model of steadfastness and devotion to the faith. Once a slave of Umayyah ibn Khalaf, a fierce foe of Islam and Muhammad, Bilal’s master began torturing him on learning he had chosen Islam. He ordered his slaves to lay him on the hot sand, with huge stones placed on his body, so he would recant. He refused, and the Prophet sent Abu Bakr to purchase his freedom. He went on to become Islam’s first Muezzin (caller to prayer) in Islam’s history. According to Ibn Ishaq, Abdullah Ibn Zaid said to the Prophet (S) that he saw the Adhan (the method for calling to prayer) in a dream; Umar came to the Apostle, saying that he had seen precisely the same vision. When the Apostle was told of this, he said that it was a true vision if God so willed it, and that he should go to Bilal so that he might call to prayer thus, for he had a more penetrating voice. In 622, the year of the Hijra, Bilal migrated to Medina. He fought in the Battle of Badr, the Battle of Uhud, and Battle of the Trench. Bilal's finest hour came in 630, in the triumph at Mecca, as he ascended to the top of the Kaaba to call the believers to prayer - the first time the call was heard in Islam's holiest city. After the death of Muhammad(S) in 632, Bilal married and lived in Syria. Bilal ibn Rabah died there between 638 and 642 AH at about age 60. 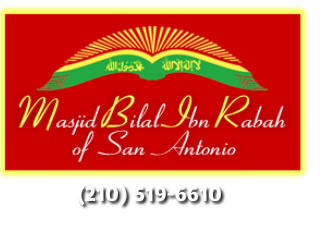 Masjid Bilal is very much a part of the extended San Antonio community. Our goal is to build in the heart of the southeast side of San Antonio where we plan to embrace the surrounding community and continue our contributions to the community at large. "The Masjids of Allah should be maintained by those who believe in Allah and the Last Day, establish Salah and pay Zakat and fear none except Allah"!